One way to not let all this winter weather get you down this season is to engage in winter weather sports and activities. Snowmobiling is one activity that winter sports activists find enjoyable. Our Boston personal injury attorneys want to remind snowmobilers to stay safe. A recent snowmobile accident in Winchendon has left one man fatally injured according to The News Telegram. The 48 year-old man was riding his snowmobile on New Boston Road near Lake Dennison when he crashed into a metal gate. When police arrived the victim was unresponsive and pronounced dead from injuries suffered during the crash. The Boston Herald reported this is the third snowmobile fatality in Massachusetts this year. The Lake Dennison area recently reported another fatality when the snowmobiler struck a tree near New Boston Road. The third fatal incident occurred in Methuen at the end of January. – Maintain a reasonable speed at all times. Excessive speeds can be extremely dangerous, especially in certain weather conditions. – Operators must be 14 years of age or older to drive a snowmobile in public areas or across highways. Children should only be permitted to drive if they have a full comprehension of the machine and all its parts. Children should always ride with a companion. 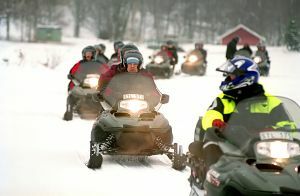 – Snowmobiles are built for one or two passengers so don’t ride with more than what your machine is capable of holding. – Refrain from lending your snowmobile to inexperienced drivers. – If your snowmobile becomes stuck, never lift the rear to free the track. Debris such has ice chunks, sticks, or rocks could shoot out at you in high velocity and cause severe damage. – Before heading out in a group to ride, practice handling your snowmobile to get used to how the machine handles. Practice maintaining balance on turns, speed velocity, and maneuvering so you feel in complete control of the vehicle at all times. – Maintain a safe distance to the snowmobile in front of you when traveling in large groups. Conditions are often unpredictable causing quick turns or short stops. – Reduce speed on ice or hard packed snow. Maneuvering a snowmobile can be difficult due to the adverse conditions you may need to drive in. Snowmobilers are reminded to slow down and use caution while you enjoy the ride. Failure to do so could result in a severe or even fatal injury. If you or a loved one have been injured in a snowmobiling accident in Massachusetts, contact the Law Offices of Jeffrey S. Glassman for a free consultation to discuss your rights. Call 1-877-617-5333.